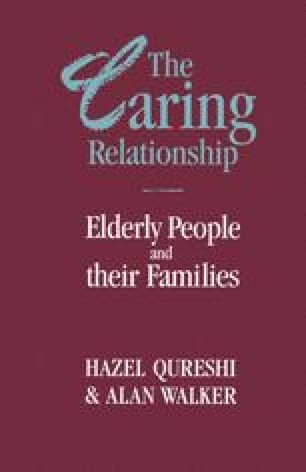 The previous chapter concentrated upon the substantial minority of elderly people who received at least weekly practical assistance from friends or relatives, and in this context attempted to uncover the general structure of normative beliefs determining upon whom the obligation to provide assistance is assumed to fall. Discussion of individual relationships, and the experience of reciprocity and emotional closeness, were largely eschewed in order to focus upon the practical, instrumental aspects of tending activity, and to investigate the material and ideological structural factors which might be said to influence those who provide such care. However, such specific instrumental activity is, of course, only one element among a range of types of activity and feeling which constitute our idea of what is meant by the term ‘care’.